Dinard is on the coast of north-eastern Brittany, across the Rance Estuary from Saint-Malo. The origins of Dinard as a fishing village were first pushed aside at the end of the 19th century, when the rich and fashionable of the time built their luxury houses here. Dinard is affected by the warm gulf stream so has an unexpectedly mild climate for the region. By the end of the 19th century Dinard was considered to be France’s no. 1 seaside resort and was the place to go and be seen by the rich and famous. As a result of its 19th century popularity Dinard now has lots of attractive villas and houses and because of their very individual and eclectic style many of them are protected buildings. France Ths Way comment: the height of the resort's popularity has now passed and resorts such as Biarritz in the south-west of France and Mediterranean resorts in the south-east are more popular but none-the-less the combination of beach, beautiful architecture and a lively shopping centre make this a very pleasant and popular resort. 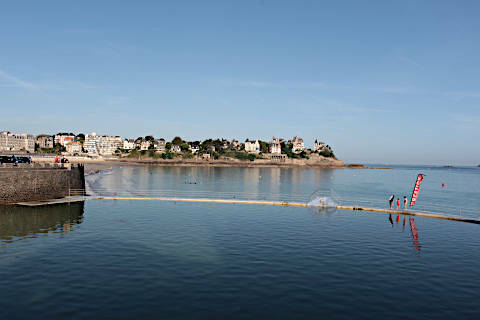 Start your visit to Dinard in the sea facing part of the town. Some of the best examples of the 19th century houses can be seen along the sea-front, and there are nice views out to sea. Also here in the port you can organise your boat trips out to sea and along the Rance river. The town centre has a very wide range of shops, cafes, restaurants and boutiques so if the weather is not ideal for the beach you can always go shopping! We also enjoyed exploring the numerous art galleries in the centre of Dinard - we were pleased to find that there are even some among them where the artworks are not related to the sea! 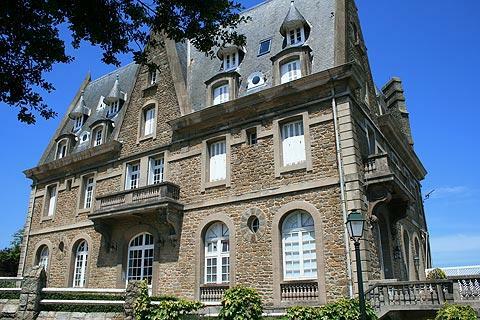 Several other important buildings will attract your attention in Dinard, typically built in the local granite. These include the 14th century Maison du Prince Noir (House of the Black Prince), a quaint little ancient priory, and the imposing Manoir de la Baronnais dating from the 17th century. We recommend you ask in Dinard tourist office for the map that suggests a route to follow through the town to ensure you see the most imposing villas and monuments. Port Breton Park opposite the Prieure beach has a large rose garden and if you have children you will also find a children’s play area. Like many beach resorts in France Dinard has a casino. This can be found on the Plage de l’ecluse - Dinard’s main beach and the location of many of Dinard’s luxury hotels. There are three pleasant beaches in the town, which are also the starting point for nice walks along the coastline, and there are several other nice sandy beaches nearby. The beaches in the centre of Dinard are the Plage de Saint-Enogat, where you can see the most imposing villas, and the Plage de l'ecluse, which has the most facilities and activities. Just a little further the Plage du Port Blanc has less amenities but tends to be quieter than the more central beaches. If you only have time to head one way out of town along the coast, head east for the views at the end of the headland called Moulinet Point (the eastern end of the plage de l'ecluse). From here you get magnificent views of St Malo across the water. Along the way admire the sumptuous villas built to enjoy the sea views. Another excellent walk is the ‘Promenade du Clair de Lune’ or ‘Moonlight walk’. The walk runs between the Prieure beach and the Pointe du Moulinet and takes you through the gardens which are lit up in the evening and have music playing. There is a daily market each morning in the Halles de la Concorde, and on Tuesdays, Thursdays and Saturday mornings there is a market in Place Crolard. During the summer (early April to early September) there is also an antiques / vide grenier market in Dinard, all day Sunday at Esplanade de la Halle. Dinard holds itself forward - with some justification - as the heart of the Emerald Coast - the attractive name given to this section of the Brittany coastline. We also enjoyed a visit to Les Jardins de Montmarin on the D114 not far from Dinard. The garden is on the banks of the River Rance and is laid out with an elegant formal garden in front of an 18th century mansion and a park further away from the house. You should also visit Dinan, a little inland at the lower end of the Rance estuary.